Magnifying Mirror with Light, Direct wired and Wall Mounted. Magnifying Mirror with lights - Hi its Debra again it the question we get most when people make enquiries so hopefully this post will help you through any question you may have. 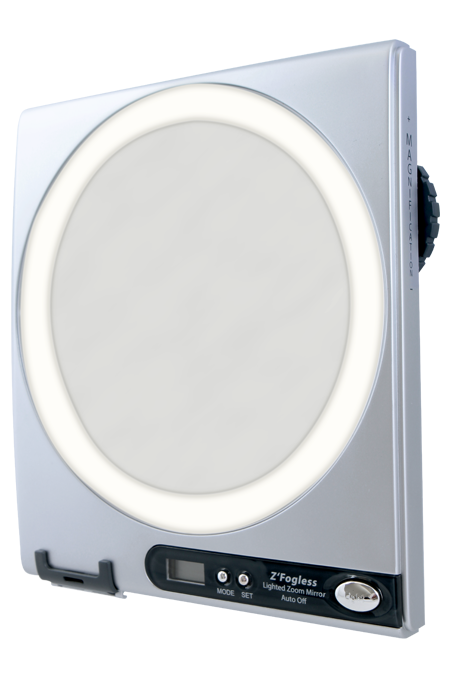 At last a magnifying mirror with light that is manufactured in direct wired 240 volt configuration for Australia. We call it our HL8 direct wired model some people call it hard wired lighted wall mounted magnifying mirror. This is the only model in our range that has been specifically manufactured as a direct wired model. To explain direct wire or hard wired depends what side of the fence you’re from. Either way direct wired or hard wired means that the mirror does not come with a curly cord. The plugin version comes with the curly cord which will plug into a nearby power point. The HL8 is manufactured so that cable that powers the light in the mirror, comes from the back of the wall plate and can be wired to the inside of the wall connecting directly to the house circuit. It requires connection by an electrician making it completely concealed. This is what hotels normally do with these mirrors, aesthetically it looks cleaner with no cables hanging about and it makes the mirror harder to remove from the wall by some less than ideal guests. We notice these day’s people are putting the direct wired model into their homes as a matter of style as a fixed piece in the bathroom. The one main question we get is how do you turn the light on and off? The on off switch is mounted on the backing plate and it’s a push button type for ease of use and easier to see. 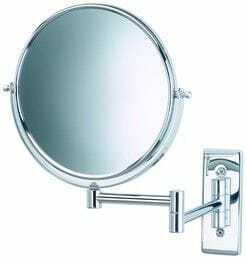 The direct wired HL8 magnifying mirror is manufactured by Jerdon in the US and is the Halo light design. Halo light simply means the outer edge of the mirror is treated so it lets the light through in a gentle diffused manner. It uses a 15 watt incandescent warm white globe which has shown to give the best natural light on your face when using the mirror. Lighting is most bathrooms is an issue as the position of the overhead light fittings either throws a shadow over you face or the light bounces of the standard wall mirror found in most bathrooms. Either way it makes it very difficult to do such things as put makeup on, pop your contact lenses in or attend to any eyelash issues. With the halo mirror its light reaches every part of your face including under your eyebrows through light coming on the face from every possible angle. If you have a dark bathroom then application of makeup can be difficult, this mirror will solve that issue forever. There have been some questions about being able to replace the globe. The direct wired HL8 comes with a spare globe in the packaging and is still ready available in the lighting stores however My Health and Beauty carries spares globes and parts for all mirrors at all times. Under normal usage in your home we expect that the globes will last up to 3 years. Speaking of spare parts we also carry the spare mirrors to refit back into the housing should one get accidently broken. The direct wired HL8 magnifying mirror with light comes in 3x magnification and soon to be in 5x with a Chrome configuration finish.. For those who want to place the mirror inside a cupboard then the following dimensions maybe of use. The widest point when the mirror is folded back against the wall is 26cm Height 25cm and the depth when folded back as far as it will go to the wall is 12cm. Hi everyone Deb again, I’m excited to tell you we have just landed our brand new Halo Lighted 5x magnified travel mirror. How fantastic is it to finally have a mirror of decent size with a light in it that actually works and folds away into a neat travel pouch. My sister loves hers so much she keeps it in the glove box of her car so she never gets caught out. If you do go to the effort of looking for a lighted travel mirror you will find it’s not easy to get a travel mirror until now that is LED and lights up, has a large diameter and 5x magnification, adjustable stand that works perfectly sitting on your vanity or folds away as a travel mirror. This LED Halo lighted magnifying mirror stands 18cm including the stand in height comes with an easy clean chrome finish and folds down flat to fit in the black velvet drawstring travel pouch. This new halo lighted magnifying mirror has an over all diameter of 15cm and the mirror itself is 13cm so it’s a very useable size. This lighted travel mirror uses lights up with energy-saving LED bulbs that illuminate your entire face, allowing you to see the finest details in even the dimmest lighting. The LED halo light with halo meaning the outer rim of the mirror throws a nice gentle glow on your face really giving you the best benefit as many bathrooms do not have great lighting. These energy saving bulbs use 70% less power than normal bulbs and is the reason when using the 3 AAA batteries then you can expect 1 -2 years battery life. Because of its versatility it also fits on those small vanities with ease. So if you are travelling or just at home then this is the ideal companion. Having two magnifying lighted travel mirrors in the range the Zadro LEDTO1 which is a 10x magnification. It is also compact enough to fit in your bag and now the new JKLEDT5X with a half the magnification at 5x for those who don’t like the strength of 10x leaves you spoiled for choice which is just the way we like it to be. Two distinct styles both very practical and the ideal travel companion. Well I hope you like our new offer and come back occasionally as we have another exciting model in the pipeline under production now. This model has come about because of your requests. We welcome such feedback and will continue to grow our range through your ideas and requests.